Our wines are handcrafted, grown sustainably and vinified classically from select European vines of the family vitis vinifera. We chose Austrian varieties because we believed they’d be an ideal match for the climate, soils and topography of Hunterdon County. Indeed, we’ve since proven that they thrive in our cold winters, hot and humid summers, and typical growing season of only five months. At 700-feet (215 meters) above sea level, our dry-farmed vineyard is graced by a gentle slope and a south-by-southwest aspect, the former draining excess cool air and rainwater and the latter magnifying the sun’s ripening power. Both are ideal for growing premium wines in a cool climate. Our soil is classified as Pattenburg Gravelly Loam comprising silt, clay and loam studded with glacial cobbles, which are smooth stones roughly the size and shape of goose eggs. These stones radiate precious ripening heat and maintain good soil drainage. In late 2004 we prepared the crest of the farm for our first vines, and began planting the following April after the ground thawed but before the spring rains. New vines were added in each of the next six years, all planted by hand and nourished naturally, without irrigation. Our estate plantings are listed below. Blaufränkisch Indigenous to Austria, Blaufränkisch is a cold-hardy and disease-resistant variety yielding wines whose style can resemble a spicy pinot noir on one hand, to a restrained syrah on the other, all with a dark red garnet color. Our experience with this grape, grown in our vineyard and in several others in the region, revealed its sensitivity to terroir, making it a very exciting wine to make. In addition to subtle pepper and spice, Blaufränkisch’s acidity makes it a food-friendly and age-worthy wine. Saint Laurent Thought to be a French native brought to Austria centuries ago, Saint Laurent vines have neither the cold-hardiness nor the disease-resistance of Blaufränkisch, making it very challenging to grow even in Austria. But when conditions permit, its wines are akin to hauntingly complex Pinot Noir, to which it was long thought related. We are among the very few vineyards in North America to grow Saint Laurent and, despite its reputation as a “heartbreak grape”, we believe it’s worth the effort. Zweigelt If one wanted a cold-hardy and disease-resistant vine whose wines had the backbone of Blaufränkisch and the finesse of Saint Laurent, then how about making a hybrid? That’s exactly what Austrian biologist and viticulturist Fritz Zweigelt did in 1922. His eponymous masterpiece is the most widely planted red in Austria for good reason. Its wines are big, soft and approachable on their own, but also harmonize beautifully when blended with its parents, Blaufränkisch and Saint Laurent, either together or separately. Cabernet Franc We planted this French native (and father of Cabernet Sauvignon and Sauvignon Blanc) because we knew it was a proven cold-hardy producer of fine wines here in New Jersey, whereas in 2005 the Austrians still were not. While best known as one of the five Bordeaux reds, it also results in wonderful wines in the Loire Valley and in northern Italy’s Friuli region. 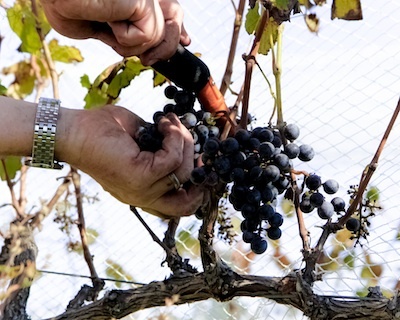 In our vineyard, Cabernet Franc has been a consistently reliable producer of fine red wine. Grüner Veltliner Indigenous to Austria and its most widely planted grape (among whites and reds), Grüner is smitten with the climate and soil here on Mount Salem Road. Like white Burgundy to which it is often compared, its wines can range from a flinty Chablis made in stainless steel to a rich, barrel-fermented Chassagne-Montrachet. Indeed, it is one of the few whites that can receive the full Burgundian treatment of barrel-fermentation, lees stirring, malolactic fermentation, and oak aging, though some Grüner devotees consider this heresy. Riesling The queen of whites, Riesling is perhaps the best-known cool-climate vine in the world, as the high acidity and low pH of its wines offer extraordinary aging potential. Riesling is the last variety to awaken in our vineyard each spring, guarding against a late frost. And while most often associated with Germany, its regal status in Austria prompted us to plant it here. Regrettably, it is also perhaps the most misunderstood wine in our portfolio: many assume Riesling must be sweet, or light and fruity, but not all – including ours – are. In addition to the six varieties in our estate vineyard, we also source grapes from other New Jersey and Eastern Pennsylvania vineyards. They are raised by highly experienced growers who share our commitment to making high quality wines.